This is Part I in a two-part series on The Crimson’s survey on College residential life. Part II will run on Monday. The majority of students who responded to a recent Crimson survey—84 percent—say they are satisfied overall with their experiences living in their upperclassman Houses, but their experiences in those on-campus residences vary. 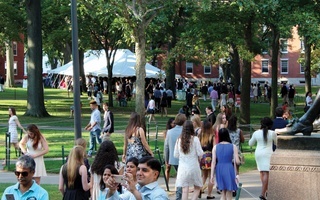 For example, while students in Cabot and Currier Houses—located in the Radcliffe Quad, farther away from Harvard Square—reported feeling slightly more satisfied with their living experiences than their peers on average, those respondents were much less excited when they learned of their housing assignments their freshman year. According to the survey, 48 percent of respondents reported feeling very satisfied with their House, while 36 percent said they are somewhat satisfied. 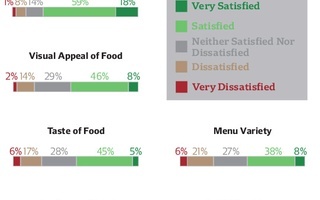 Eight percent reported feeling neutral, 5 percent somewhat satisfied, and 3 percent not at all satisfied. Of all the Houses, respondents from Lowell House they were most satisfied (91 percent), followed by Adams, Quincy, Currier , and Cabot. Respondents from Winthrop House, meanwhile, reported the lowest overall rate of satisfaction, which still totaled 77 percent. Though all of Harvard’s 12 residential Houses—each home to between 350 and 500 upperclassmen— offer students dining, advising, and programming resources, each House varies in its character, traditions, and housing accommodations. Harvard touts its House system as a cornerstone of student life, but students this year have criticized administrators for what they see as the pitfalls of on-campus social spaces. As students debate the quality of College social life and administrators look to increase the importance of the Houses in upperclassman student life, The Crimson conducted an anonymous survey of Harvard upperclassmen about House and student social life. Conducted by The Crimson, the survey was emailed to College sophomores, juniors, and seniors on Oct. 25 and closed on Nov. 8, garnering responses from 1,128 students, just under a quarter of upperclassmen. The Crimson did not adjust the survey results for any possible selection bias. The survey asked upperclassmen dozens of questions on topics ranging from their thoughts on Harvard’s ongoing House renewal project to their experiences on Housing Day, residential advising, and facilities. The results indicate that while students are overall satisfied, they also perceive inequities between Houses. Just before spring break each year, blocking groups of freshmen receive random assignments to live in one of the College’s 12 Houses for the rest of their time as undergraduates. On festivities known as Housing Day, hundreds of enthusiastic upperclassmen don T-shirts promoting their Houses and storm the Yard, chanting and dancing as they deliver letters to their newest residents. Overall, most survey respondents—64 percent—said they were excited when they learned what House they were placed in on Housing Day. Thirty-nine percent said they very excited and 25 percent somewhat excited; 15 percent of respondents felt neutral, while 12 percent were not very excited and 8 percent not at all excited. But between Houses, levels of excitement and outlook on Housing Day vary. - Eliot House residents surveyed said they were the most excited on their freshman Housing Day, with 93 percent reporting feeling very or somewhat excited. Close behind are Quincy residents, at 90 percent, and Kirkland (86 percent), Adams (85 percent), and Lowell (82 percent). - Students who were placed in the Quad and Winthrop House were considerably less excited on Housing Day: Of respondents placed in Currier, 29 percent reported feeling very or somewhat excited, compared to 35 percent in Cabot and 39 percent in Winthrop. - Respondents, asked which House they would have chosen had they had their pick on Housing Day, overwhelmingly favored the Houses along the River and in Harvard Square. Twenty percent would have chosen to live in Adams, and the next most popular were Eliot (19 percent), Quincy (16 percent), and Lowell (13 percent). Winthrop (at 1 percent), Cabot (2 percent), Currier (2 percent), Leverett (3 percent), and Mather (4 percent) were less popular. - The survey asked respondents to rank the Houses according to their desirability. Adams House garnered 219 first-place rankings, followed by Quincy House with 176, Eliot with 124, and Dunster with 121. Most other Houses hovered between 30 and 80 first-rank votes. - Three-hundred and sixteen respondents ranked Winthrop House last; Currier was ranked least desirable 288 times, Cabot 151, and Mather 114. - Fifty-six percent of respondents reported participating in Housing Day activities last year. Respondents in Adams reported the highest participation level (68 percent), Winthrop (68 percent), and Lowell (62 percent). Leverett respondents were the least likely to say they participated in Housing Day activities (43 percent), followed by Cabot residents (47 percent). - When asked, 18 percent of respondents said Harvard should assign students to Houses before freshman year, as Yale does. - Nineteen percent of respondents said Harvard should not assign students to Houses randomly, as it has since the late 1990s.Speaking to their college admissions decisions, 31 percent of respondents said Harvard’s House system influenced their decision to attend Harvard. As a part of Harvard’s roughly $1 billion House renewal project, parts or all of three Houses have undergone major renovations meant to rethink common spaces and entryways: Quincy’s Stone Hall, Leverett’s McKinlock Hall, and most recently all of Dunster House. Winthrop is slated to undergo construction starting next summer and Lowell House the year after. But with a mission to revitalize House Life, some students have critiqued the renewal process so far for its changes to existing living arrangements, which move away from private spaces like in-suite bathrooms and toward more open common spaces. - A majority of survey respondents (76 percent) said they agreed with the statement that “House renewal will improve the quality of student life on campus” (36 percent indicated strong agreement and 40 percent somewhat agreed, while 9 percent neither agreed nor disagreed, 8 percent somewhat disagreed, 5 percent strongly disagreed, and 3 percent were unsure). - When respondents were asked whether Harvard should prioritize space for in-suite common-rooms or common House-wide spaces in House renewal plans, 75 percent chose in-suite common rooms, while 13 percent chose common spaces. Eleven percent reported feeling unsure. - Among respondents who live in renewed Houses, their preference for in-suite common rooms was slightly higher than average. Eighty-one percent of Leverett respondents, 80 percent of Dunster respondents, and 78 percent of Quincy respondents choosing in-suite common rooms. - Among Houses that have already been renewed, responses were more mixed as to whether House renewal will improve the quality of student life on campus. Compared to respondents overall, more Dunster residents (83 percent) agreed. A slightly smaller proportion of respondents from Quincy and Leverett Houses, though, voiced their agreement, at 73 percent and 71 percent, respectively. - The survey also asked respondents whether they agree that House renewal will make the Houses more central to student life on campus. Of those surveyed, 15 percent strongly agreed and 34 percent said they somewhat agreed, while 16 percent somewhat disagreed and 9 percent strongly disagreed. —Staff writers David Freed and Idrees M. Kahloon contributed data analysis. —Staff writer R. Blake Paterson can be reached at blake.paterson@thecrimson.com. Follow him on Twitter @BlakePat95.